Liquid enters the suction port between the rotor and idler teeth. The Liquid travels through the pump between the teeth of the “gear-within-a-gear” principle. The crescent shape divides the liquid and acts as a seal between the suction and discharge ports. The pump head is now nearly flooded, just prior to forcing the liquid out of the discharge port. Intermeshing gears of the idler and rotor form locked pockets for the liquid which assures volume control. Rotor and idler teeth mesh completely to form a seal equidistant from the discharge and suction ports. This seal forces the liquid out of the discharge port. Non-Pulsating Flow for clear fluids. A variety of material options available to suit corrosive media as well. Viscosity : Upto 30,000 Cst. The Principle of Operation of our Rotary Lobe Pumps are Two Synchornized Rotors (Lobes) rotating against each other build chambers towards the Casing of the Pump. At the suction side, the fluid enters the chambers and during rotation, the fluid is displaced in the direction of the volume flow in to the Discharge side. Capacity : Upto 50 M3/Hr. ROTOMACTM Triple screw pumps use a simple design with only three screw elements Driving(1) & Idlers(2) moving in very precise liners. The unique profile of the screws ensure the liquid to be tightly sealed between the threads, hence as the screws rotate, the liquid is conveyed from one end to the other. This pumping action is seamless and almost noise free. The power rotor is connected directly to the the prime mover, and as it rotates, the idlers turn due to the action of the pumped liquid. This action is in effect, that of a piston moving continuously in one direction, producing a smooth uniform flow without pulsations. As the idlers perform no work, no gears are required to transmit power between the screws. As radial forces on the idlers are taken up by the surrounding cylindrical surfaces, no other bearings are required. Axial forces on the screwset caused by the pressure differential between inlet and outlet, are balanced hydraulically within the pump. Another unique feature being, screws are hydro-dynamically balanced due to film lubrication, hence no additional bearings are required. Only one ball bearing is used for the axial positioning of rotor and safer operation of mechanical seals. Such unique design and features has demonstrated excellent reliability .With continuous non- stop running for years with almost negligible maintenance required. ROTOMACTM Twin Screw pumps are robust in design and capable of handling a variety of liquids with diverse operating parameters which generally cannot be handled by other Positive Displacement Pumps. 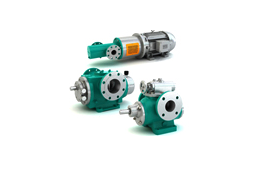 The pump consists of a pair of profiled screws supported on anti-frictional bearings. Torque is transmitted from the driving shaft onto the driven shaft by hardened and ground timing gears arranged in the gear box. The speeds of both the screws are therefore synchronized. Timing gears maintains a small clearance between the moving screws, which enables the pump to even run dry. Since there is NO contact between the moving screws there is absolutely NO wear and tear of internal parts of the pump which gives extremely high trouble free and maintenance free operation for years together. As both the screws move in opposite direction, the screws are perfectly balanced. The internal velocities are very low enabling the pump to operate with very low NPSH even when operating at full motor speed. The seals are located at the suction side and therefore are always under suction pressure due to the typical flow of the liquid, enhancing the life of the seals. The liquid is virtually carried between the screws in a straight path and hence it is not subjected to Turbulence, Churning or Chewing.